It seems that some strange people have a pathological aversion to the Windows command shell or maybe cannot read English text and type Y or a number on a keyboard (??) and so they do not like running the E2B .cmd script files to make a USB drive. So I have written a small Windows GUI called Make_E2B.exe which will run the scripts for them! I hope to release v1.88m as 1.88 Full Release version in a few days. Please try it and let me know if you find any problems. MAKE_THIS_DRIVE_CONTIGUOUS.cmd now only works on the USB root (\) folder and all folders under \_ISO. Any user folders under the root (e.g. disk backups, applications, etc.) will not be made contiguous when the script is run. 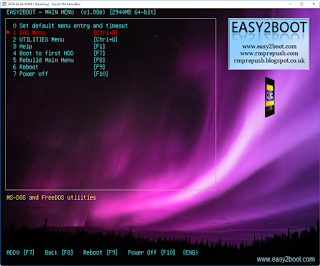 MAKE_E2B_USB_DRIVE.cmd can now be run from your E2B USB drive to make a new E2B drive. Download is available from the Alternate Download Areas. Flaming Floe has reported a problem when installing Win7 from an ISO with the latest v1.88k version. The AutoUnattend.xml file is not correctly cleared and so appears corrupt when Windows Setup loads it. This bug will probably affect most Windows Install ISO runs, but not all systems will show the symptoms and some will appear to work (and others will give an Unattend error). After investigation, is seems that there is a bug in the new 2016-12-24 version of grub4dos (\grldr) that is used in v1.88k. E2B v1.88l now uses a previous version of grub4dos (2016-12-23) which I think is OK. I have reported the bug here. Unless your E2B USB drive has become almost full at one stage in it's life after formatting it, the \MAKE_THIS_DRIVE_CONTIGUOUS.cmd script should run WinContig fairly quickly and without any problems. Obviously, having a fast USB 3.0 E2B drive helps though! Never download from the internet directly onto your E2B USB drive. This can cause the file to be heavily fragmented (even if you have lots of contiguous free space on it). You will find it best to always download files onto one of your internal drives first and then copy the file to your E2B USB drive. That way you also have a backup too! Do not use 'special' fast-copy programs like robocopy or TeraCopy, etc. to copy files to your E2B USB drive. These often open multiple threads which results in fragmented files. This just means WinContig will then have to defragment them on the USB drive and so it just takes much longer overall! Only start one copy session at a time. You can select multiple files and then drag-and-drop them onto the E2B drive, but don't start another copy session until the first one has finished. Not only can this cause file fragmentation, but it often takes longer too when copying to a USB drive. You can only defragment a file if there is enough free space on the USB drive to hold a second copy of it. A 6GB file will require at least 6GB of free space (in a single chunk). If your E2B USB drive has become nearly full at one stage and WinContig is not able to defragment a large file even though there is enough free space for the defragmented file, try using Defraggler - Action - Advanced - Defrag Freespace. This will consolidate the free clusters into one nice run. However, you should first delete any large fragmented files before you run it. This action can also fragment some files that were previously unfragmented, so the next run of WinContig will need to defragment them again. Then try adding your large file(s) again and finally run WinContig again. Defraggler will also show you a nice map of the used clusters and fragmented files (Analyze). You can also right-click on any single file in Explorer and use the Defraggler option to 'Defragment' it. If using an 8GB NTFS E2B drive, it may not be able to hold a contiguous 4GB+ file. This is because the directory table ($MFT) will be at the 3GB position on the drive and so a 4GB+ file may have to be split if other files are also present. See here for more details and a way to work around this issue (or you could just buy a bigger USB drive!). Finally, don't buy USB 2.0 drives. A USB 3.0/3.1 drive should always be faster, even on a 2.0 USB port and they are backwards compatible. I highly recommend the SanDisk Extreme USB 3.0 range. P.S. As chi zhang says in the comments below, if you have a nearly full USB drive which is quite slow, it is often faster to just remake the USB drive again - then all the files will be contiguous because the drive will be reformatted. See here for more details. Often a Windows system cannot boot (not even to the recovery mode), but the recovery partition on that system will contain the correct WinRE.wim file that can be used to repair that OS. He wanted to be able to boot to Easy2Boot and then boot to the WinRE.wim recovery file that was on the internal hard disk. That way, he could be sure he was using the correct version of the recovery .wim file for that system. Also, his E2B drive did not need to contain all of the possible Windows install ISO versions that there are in the world! E2B can directly boot to an NT6 .wim file; you just need to specify the full path of the .wim file. The problem is that different Windows systems keep the .wim file in different folders. To further compound the issue, on his Windows 7 systems, the directory name often varied on different systems, e.g. You need to be an experienced techie to make an E2B USB drive, don't you? Watch this video by young Marcus for your answer (and give him a 'like' too)! You can add these to your E2B drive is to convert each ISO to a .imgPTN file using the MPI_FAT32 shortcut provided by the MPI Tool Kit. It should then MBR or UEFI-boot. For the x64 ISO you will need to increase the suggested size to 5100MB. For the x86 ISO you will need to increase the suggested size to 4300MB. Tips: If you want as small a .imgPTN file as possible, extract the contents of the ISO to an empty folder on your desktop and then drag-and-drop the folder onto the MPI_FAT32 shortcut. Use a file extension of .imgPTNauto so that it goes directly to the CSM menu and also add a timeout 3 line to the \menu.lst file inside the image. E2B v1.90 and later supports direct booting of WinBuilder-based ISOs. 3. (optional) If you want to suppress the QRUN suggestion prompt, ensure the filename ends with the letter q or Q - e.g. Gandalfx64_q.iso. I have uploaded an Animated_Flags.zip file to the Alternate Downloads - Other files folders. The PIXEL ISO (Debian+PIXEL for Intel x86 CPUs) will boot if you copy the ISO to your E2B drive. It is designed to run on old, low-spec systems and be easy to use. However, to be able to use the persistence option, you need to create a pixel-rw ext4 file and then create a persistence.conf file within it. Here is the .mnu file for it. New jpeg-based default purple background for 2017 - should load faster. Some changes to QRUN.g4b and language files. The v1.88g Beta Download is available from the Alternate Download Areas. I have just ordered one of these for $71 from here as the price has just been reduced (£67 in the UK). I have not tested one yet, but I am hoping it will prove to be slightly faster than the SanDisk Extreme USB 3.0 flash drive ($58) which I highly recommend for normal E2B use. New jpeg-based default purple background for 2017 (see screenshot below). Please update your E2B drives and let me know if you spot a problem or have a comment. This is considered a 'release candidate' for 1.88. The guys at Foolish IT have a 20% sale on all their products at the moment (if you are quick). For IT Technicians look at their d7ii software. Their latest video about the d7ii Support Online tool is here and they have a channel on YouTube here too. For their crypto-prevention malware solution (they were the original pioneers of the honey-pot method) check out their CryptoPrevent product (there is a free version too!). They also have some other free software which you can download here.